Three students who made others aware of their right not to say the Pledge of Allegiance are stunned by the emotional reaction. SOUTH PORTLAND — It’s a story about three top students at South Portland High School, four little words added to the daily invitation to say the Pledge of Allegiance, and a provocative Facebook post that provided an unexpected lesson in the politics of the freedom of speech. Senior class president Lily SanGiovanni sparked community outrage in January when she changed the way she invited students and faculty members to recite the pledge. It was the latest salvo in a monthslong effort by SanGiovanni and some of her friends to make it clear that reciting the pledge is optional under state and federal law, so students cannot be forced to stand and say it every morning. Although no students have filed formal complaints in recent years, SanGiovanni and her friends said they and other students have felt uncomfortable or pressured by their teachers to say it. The addition of “if you’d like to” inflamed simmering opposition from staff members who had been wrestling with the pledge issue since June. It also triggered an emotional, anti-immigrant backlash in the community and left SanGiovanni and her friends searching for a way to carry their cause forward. Supporting SanGiovanni’s campaign are two other top seniors, Gaby Ferrell and Morrigan Turner, who lead the student senate and are the student representatives on the South Portland School Board. All three teens belong to the high school’s Civil Rights Team and believe that students who have different religious or political beliefs shouldn’t feel compelled to say the pledge. SanGiovanni first delivered the altered pledge invitation on Jan. 5. She and her friends heard positive feedback from some students and teachers, but they were aware that other students and teachers thought it was disrespectful, she said. SanGiovanni continued with the four-word addition for a couple of weeks before news of the change spread to the wider community. By Jan. 15, a Facebook post by a local businessman was drawing a flurry of anti-immigrant, anti-welfare, pro-veteran comments from people who assumed that the students behind the change were immigrants. South Portland High’s 900 students include immigrants and the children of immigrants from countries across the globe. Soucy’s post was “liked” by 69 people, shared 11 times and commented on by about 40 “friends,” including folks who live outside South Portland. “I say (send) them back where (they) came from – they must like war better than freedom,” wrote one commenter. “This is disgusting and very discouraging for the next generation and good parents like yourselves. Something has got to change,” wrote another. Soucy declined to comment for this story. On Jan. 20, Principal Ryan Caron asked SanGiovanni to stop saying “if you’d like to,” or pass the privilege of leading the pledge to another student. Caron often attends meetings during morning announcements, so he had been unaware of the change, he said. He learned about it from teachers. He also received a few emails from community members. And he saw Soucy’s Facebook post. SanGiovanni complied with Caron’s request because she was concerned that people thought the principal was “in cahoots” with her efforts. Still, she and her friends were stunned that their campaign to inform students of their legal rights was trumped by political pressure from uninformed community members. 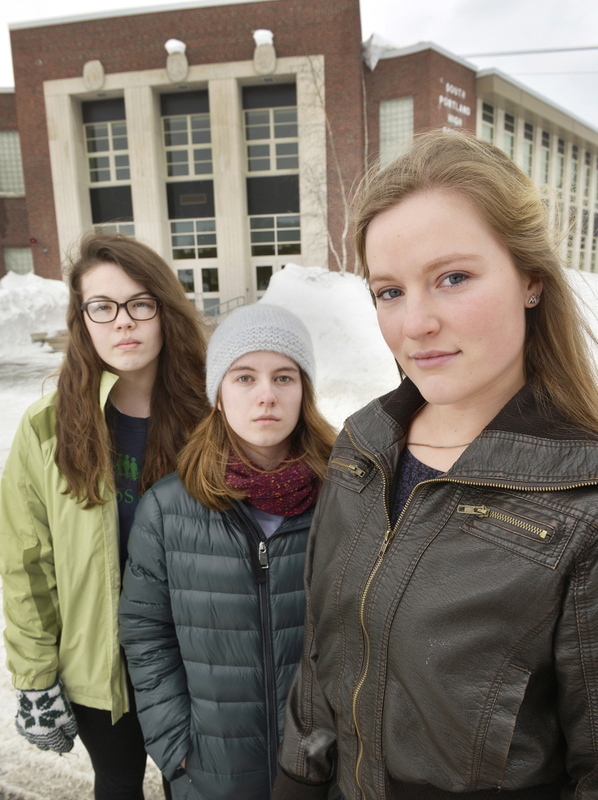 SanGiovanni said it’s ironic that community members assumed that the students behind the change were immigrants, “especially since we’re three privileged white girls.” SanGiovanni plans to study biology and neurosience at Wesleyan University, Ferrell plans to study sociology at Barnard College and Turner plans to study earth science at Vassar College. Students have protested saying the pledge in school for decades. California school officials apologized last fall after a student who was an atheist reported that a teacher compelled him to say the pledge. The Massachusetts Supreme Court ruled last spring that reciting the words “under God” in the pledge doesn’t discriminate against non-religious students who hear it. Under a Maine law passed in 2011, public schools must allow every student “the opportunity to recite the Pledge of Allegiance at some point during a school day in which students are required to attend,” but they cannot require students to say the pledge. South Portland High hadn’t been saying the pledge each morning, but resumed the practice on Sept. 12, 2001, the day after the terrorist attacks on the World Trade Center and the Pentagon, SanGiovanni said. SanGiovanni, who has been class president for four years, assumed the duties of saying the morning announcements and leading the pledge last June, after the class of 2014 graduated. She and her friends had discussed how she would handle the pledge, so when the moment arrived, she asked for a moment of silence when students could stand and say the pledge. A secretary in the principal’s office grabbed the microphone and recited the pledge that morning and for the rest of the school year, SanGiovanni said. Principal Caron advised her that if she wanted to change the way the pledge was said, she’d have to make a formal presentation to the faculty leadership team, which consists of 12 department heads. When the new school year started in September, SanGiovanni began each morning with a traditional invitation to join her in saying the pledge. On Sept. 11, she and her friends delivered a digital presentation to the leadership team, asking to replace the pledge with a moment of silence during the announcements, when students would be allowed to say the pledge in their classrooms. A month later, the leadership team voted 11-1 to reject SanGiovanni’s proposal. SanGiovanni said the leadership team never formally notified her of its decision, so she and her friends decided to add “if you’d like to” in January. Amid the controversy, Caron said, he has reminded faculty members of the laws related to the pledge and warned them against intimidating or compelling students to say it. He has advised SanGiovanni and her friends that they could seek broader student support for their cause, gather signatures on a petition and submit a new proposal to the faculty leadership committee, he said. SanGiovanni and her friends aren’t sure what their next steps will be. They see a need for a written policy, but their experience with the emotional and complicated responses to reciting the pledge has been overwhelming. Some staff members have sat them down and told them long stories about loved ones who died in battle and other reasons why they love the flag. Ultimately, the young women want students and faculty members to understand that the liberty espoused in the pledge includes the freedom not to say it.